Read and follow installation instructions: Installation. 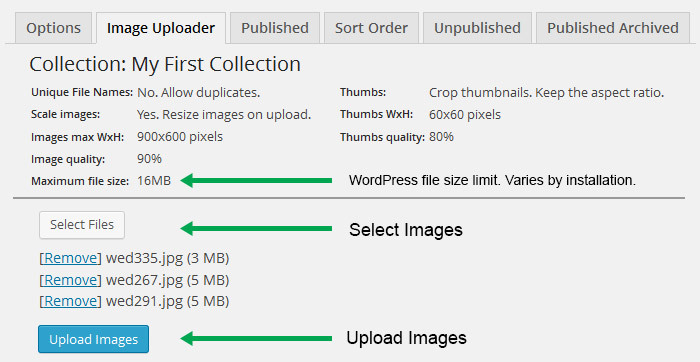 Collection = set of images stored in a separate folder. Go to Image Collections > Add New. Review and change options before uploading any images. Click Options tab if not already opened. Check and change options as needed. Upload a few test images. Accepted file formats: JPG, GIF, PNG. Select a few test images. Upload will start. Wait until all images are uploaded. Upload in progress. Do not close browser window until all images are processed. Add image title, captions, links and other text. Click and drag an image to a new location. Repeat for other images you want to reorder.